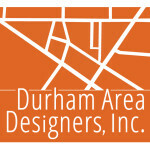 THE MISSION of the Durham Area Designers is to facilitate good urban design. WE OPERATE inside the space between the citizen and the various agencies of local and federal government to effect better cities and public spaces. WE ARE TRAINED as architects, landscape architects, designers, planners, developers and community advocates. WE ARE UNITED in our willingness to use the tools of our trades under a nonprofit umbrella for the greater common good. Durham Area Designers has open membership and all who are interested are invited to join.